Cryptocurrency News – Why you should not underreport crypto gains? Globally, countries are encouraging investors and traders to report their cryptocurrency gains and losses. However, the percentage of people who report their cryptocurrency trade activity is pretty limited. The deadline for US citizens is quite near. However, it does not seem like many of the US citizens are keen on reporting their crypto income. It might not be the right decision in the longer term. It is much better to be on the right side of the law and report the cryptocurrency gains. We will elaborate on this below. Why you should not underreport crypto gains? In the last one year, the cryptocurrency markets have been in the doldrums. Most of the cryptocurrencies have fallen significantly. That is why the only individuals who might have gained in the past year are the individuals who trade cryptocurrencies daily. The problem is that the higher your trading activity, the more will be the chances that you might get caught up in the tax net. Owing to this very reason, it might not be such a good idea to avoid reporting your crypto gains and losses. It is one of the main reasons why you should think seriously about reporting your cryptocurrency activity. Increasingly, the IRS is working with various cryptocurrency exchanges to get more user information. The exchanges are also readily supplying customer data. The problem is that if you have not reported your cryptocurrency gains or losses, IRS will get the data from the cryptocurrency exchange. It will be matched up with your tax returns. If you have not reported the cryptocurrency gains or losses or if you have underreported them, it can cost you dearly. A much better option is to report your cryptocurrency income and pay the taxes accordingly. If the IRS can figure out that you have underreported your earnings, you might face an audit. In such a case, there will be intricate scrutiny of your finances. That will not just be limited to your cryptocurrency activity. It can extend to your overall finances as well. 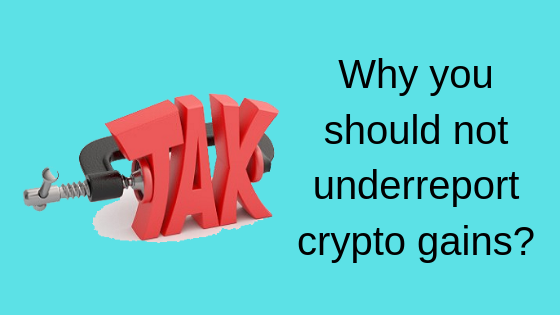 Chances are, you might have made some mistake in your tax returns, and therefore, you can face a penalty which will be much higher than just the tax on your cryptocurrency activity. Due to this very reason, it is a much better idea to not under-report your cryptocurrency earnings. There are many programs available online which can actually help you in filing cryptocurrency taxes. You don’t need to enter each and every trade. You just have to enter the total gains and losses. Once you do that, you’re good to go. So, if you’re planning on keeping mum on the cryptocurrency gains or losses, it might not be the right decision. In the future, it can result in penalties and audits which can prove to be pretty costly. Cardano (ADA) News – Cardano Rally: Is it different this time?